Playing guitar and writing music has always been a passion and a dream that I would never completely let die out. Several times, I had taken long breaks from playing for various reasons, but always kept writing music and poetry, what remains now, is a collection of songs and poems I hope to share with all who take interest. My early influences were Roy Clark, Elvis, Johnny Cash, and later, the Choir at St. Joseph’s Catholic Church. It was in the Catholic School at St. Joseph’s in Milton that I met a friend who influenced me with his talk of “guitar lessons”. Years later he would inspire the recently (2015) recorded song, Razor Rat. Then the British Invasion! Beatlemania and Bubble Gum Cards. I started playing air guitar and my interest grew. Next there was the discovery of Jimi Hendrix on the FM air waves one night listening to my new transistor radio. Finally, in 1970 I was given a copy of Led Zeppelin III for Christmas. My fate was sealed! I bought a friend’s old guitar in 1973 and learned a few chords. It was stolen later that year along with everything else I owned outside Gallup, New Mexico. Drifting finally landed me in jail in Little Rock, Arkansas for hitchhiking on Route 40 East. Gathering up what remained of my lives at this point I started the long slow process of healing. 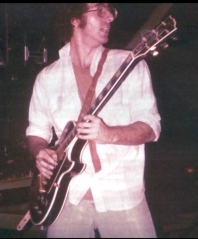 In 1974 I settled in my hometown, Milton, PA. and eventually started playing electric and acoustic guitar. In 1975 I joined a local Country band called the Sundowners. Love for rock eventually led me to meet what later became known as Jonah’s Wail in 1976. I started playing lead guitar with Angry Moon in 1979, Rampage in 1983, and have continued to play and write music ever since, with a long break from bands between 1985 and 2000. During this time I became a nurse. Since then I have worked my way up through the nursing ranks from CNA, to LPN and currently an RN going on 26 + years total, in nursing. Giving lessons at the Studio Brick in Danville between 1996-1998 provided much needed inspiration to continue live performances. I satisfied the need to play by performing solo gigs at coffee shops, dinner engagements, and private parties. In 2000 I was with a duet called Time Leapers, and from 2005 thru October 2008 the band called Rock Therapy. Prior to this I was a guitarist with an Acoustic Classic Rock trio called Zen Again 2016-2018 , and had just joined another Trio called Strawbridge, who will now continue on as a Duo. I was fortunate be able to finish my 2nd CD just days before my playing came to an abrupt halt. Playing guitar and writing music has been the deepest most powerful desire in my life. I believe that no matter how things turn out, I will somehow find a way to share my music, in some form. Thank you for supporting Local and Original music!